Kaena Point is a very special place. 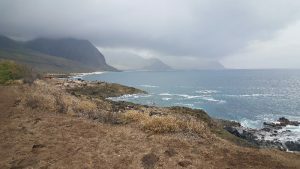 It feels like the Northern Hawaiian islands because there is some very important conservation work in progress on the remote and scenic northwestern tip of Oahu. 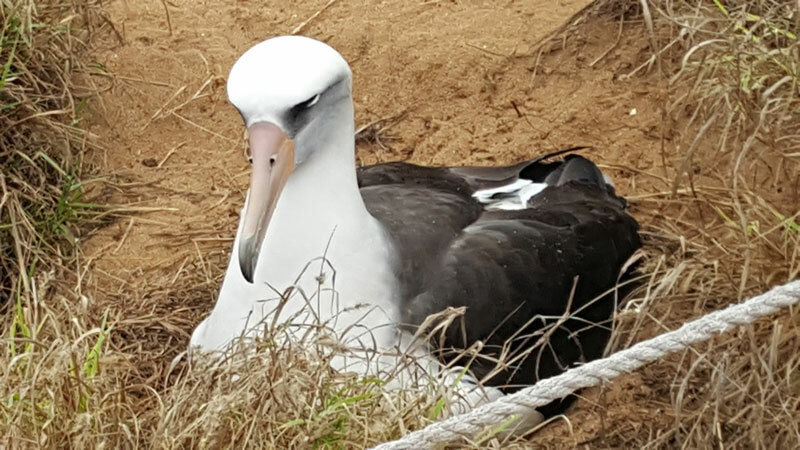 It is here that Laysan Albatross and Shearlings are safe to nest on the ground. My close friend and fellow artist, Dawn Yoshimura, and her husband Anders suggested the outing and we all went on a cloudy Thursday after making sure the rain was not going to be an issue. 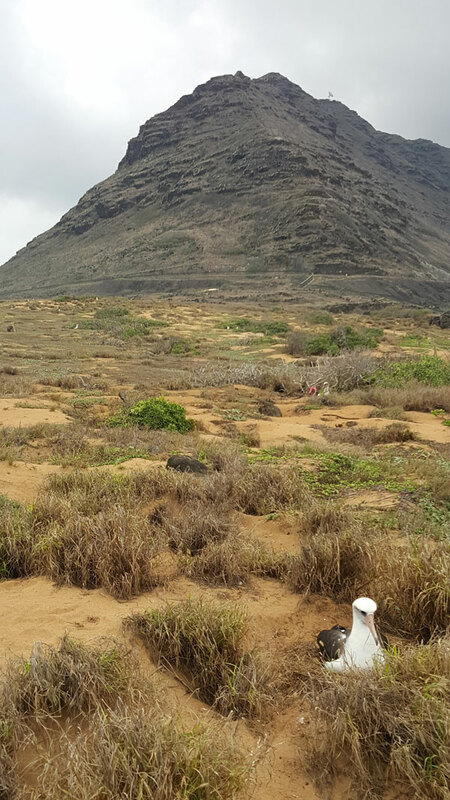 The hike into the tip of Kaena is very scenic. The mountains of Makaha and Waianae fade into the distance, and features the constant sound of the crashing waves to help your mind wander. Sometimes the waves are so foamy that they look like milk. 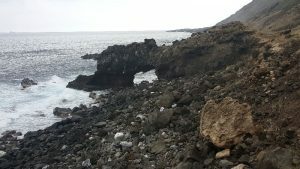 Usually this is a very hot and sunny location with a deep blue ocean contrasting with the parched lava rock of this desert-like area. On the day I finally made it all the way to the point, we were fortunate. The constant cloud cover made for excellent hiking weather, and evenly-lit photos. The ocean looked like steel, reflecting the overcast sky, still crashing mercilessly against the sea cliffs below. In some places we saw sea arches. Kaena Point has a few sea arches if you watch the coast. We also experienced the overpowering scent of a remnant of a whale carcass which is unusual. Hopefully if you ever go, to Kaena, this will not be a feature of your hike. Part of the amazing work being done on this site is the unfortunate but necessary eradication of all rodents. This is a near impossible task, but the intelligent solution is to use a double door system and a rodent-proof fence to assure the birds are spared the intrusion from the introduced rodents (rats and mongoose) that have brought them to the edge of extinction by eating their eggs. The rodent control is working. 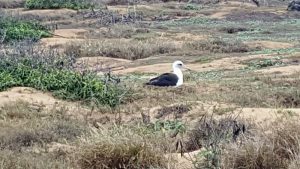 Once you cross into the fenced area, a bit of magic takes place as you slowly spot the large white albatrosses nesting directly on the ground! At first, I saw one, and I was so mesmerized, I didn’t notice two more in the near distance. We walked further in, spotting only a few birds. Then I turned around and noticed the amazing sight of dozens of birds quietly nesting. Somehow, they were there all along, but I did not see them until I changed my vantage point. Look past the foreground. Find every white speck. Each of those white dots is an albatross. They are not abundant, but there are quite a few. Do you see the sneaky one in the shadow of the bushes? Look for the pink ribbon marking the nesting site. It’s such a treat to see them nesting in a colony like this! As we looked at the beautiful birds, we decided their subtle feather gradation around the eyes reminded us of smoky eye makeup. These birds achieve a smooth gradient of color that would make any makeup artist jealous. We even got to see some courtship competition dance-off behavior. Two males tried to prove to a female that they had all the right moves. I don’t know if she was expecting to catch Disco Fever, or watch them do the Robot, but sadly for them, she lost interest in both of them and their dance moves shortly after this clip was taken. The other main attraction of Kaena Point is in this photo. Do you see it? Do you see something in this photo? Do you need a hint? Spoiler: Look at the rocks in the middle slightly toward the right side. Monk seals are a highly endangered sea creature despite their excellent camouflage. They lie on the beach to sun and rest. Sometimes they are so still that the first time I saw one, I thought it was dead. Thankfully, they are just sound sleepers. Eventually, the seal waddles back into the water using a clumsy move that looks a little like the breakdancing move, “The Worm”. Once in the water, they are graceful and quick swimmers capable of rapid tight turns. 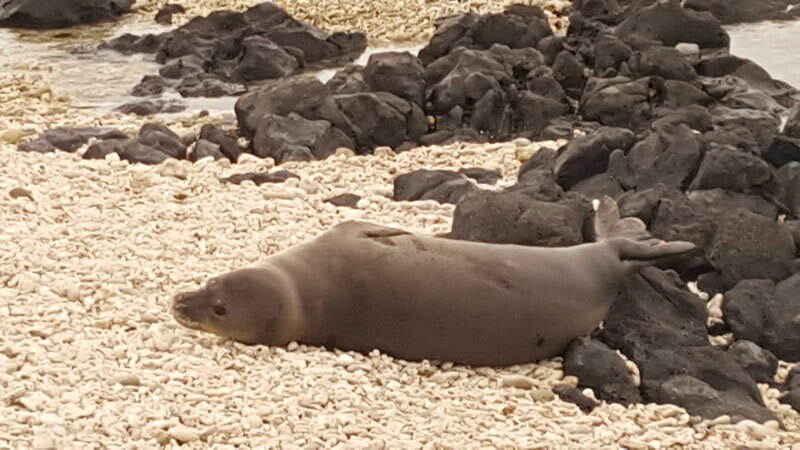 Tourists often make the mistake of getting too close to Monk Seals and Turtles. There are laws prohibiting people from getting too close to these endangered species. In the case of Monk Seals, it is also to protect people. If they feel threatened, Monk Seals can bite. While we were there, we witnessed a couple go too close to the seal. Thankfully nothing happened, but it does usually bother the animals, and it’s a sure way to show that you are from out of town. If any harm came to the seal, the tourists would have gotten a huge fine and/or a nasty bite. My tip for travelers is to keep a respectful distance and enjoy watching the animals, but never stray off the trail or go past the indicated kapu (forbidden) areas which are marked with sticks in the coral at Kaena – It’s a really clever way to make sure everyone knows the off-limits zones. 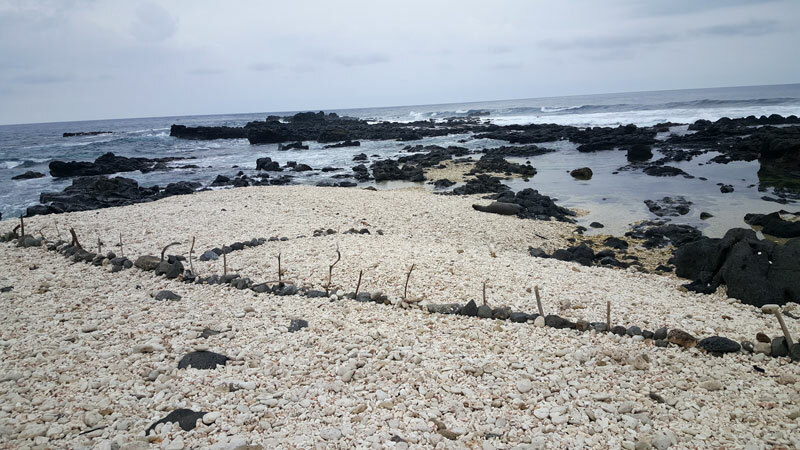 The sad thing about Kaena Point is that it shows you what the world used to look like before the human impact. It’s humbling. Thankfully, with human intervention, we can choose to save these places. Following the rules and staying on the trail is an important part of keeping the area pristine. We were lucky to see a pod of whales off the shore within easy visibility. We saw a whale repeatedly smash its tail or fin on the surface of the water, creating a huge splash each time. We saw the mist of their blowholes rising above the water as well. Amazingly, I managed to poorly capture the fin incident! On the way back, the clouds finally broke, sending a gentle chilly rain that thankfully only caught us for about 15 minutes and made us a bit muddy. This brings up a second tip: Bring plastic bags or a drop cloth, and/or a second set of shoes any time you hike here. Rain is unpredictable and very common, leaving muddy shoes that can be hard to manage. We were glad to have water and snacks too. On a sunny day, this would be a must. We drank more than twice what we normally would on the trail in the sun. Make sure to pack more water than usual to stave off thirst. Also, if you bring binoculars, maybe you will luck out and see a whale too! Most of all, just enjoy this rare place and use its inspiration to be sensitive and nurturing to our beautiful natural world!